At St. Joseph Institute, we teach the four components of the True Self: feelings, reasoning mind, intuitive mind, and will. A genuine connection with our True Self creates the basis for intimacy, the practice of getting to know others and allowing them to know you. In a series of four posts, we will discuss each component of the True Self and how each fosters or hinders intimacy. 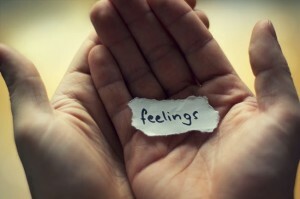 Feelings, or emotions, are the first component of the True Self. All feelings—no matter how “good” or “bad” they seem—are healthy IF they are acknowledged and used to direct us toward, rather than away from, relationship. Feelings guide our actions. Used properly, feelings can enhance intimacy by motivating us to connect and share with others. When negative emotions rise up, they can impair intimacy; they can make us imagine an unbridgeable distance between ourselves and others. When we get stuck in these unhealthy feelings for too long, they affect our relationships in several ways. When we sit in fear, bitterness, anger, or guilt, we will surely find intimacy difficult if not impossible. At this point, it may seem healthier to rid ourselves of emotion altogether; unfortunately, this drive to stop feeling is what leads to addiction. Addiction is an effective escape plan, and recovery leaves us exposed to that undertow of emotions that can so easily pull us in and drown us. The good news is that the cycle of unhealthy emotions can be broken and that healing can occur. It’s hard work. It may require professional help. It will probably make you feel worse before it makes you feel better. But it will be worth the effort. Why? Because in the end we will see that there are only two feelings: fear and love. Fear leads to separation. Love leads to connection. No matter what we feel, we can use it to separate or to connect. No matter your emotional history, you can choose at any time to use any feelings to connect rather than to separate. Value your feelings, acknowledge them, and choose connection. Foster intimacy, and, when you’re feeling helpless or overwhelmed, intimacy will sustain you.